Many people have a favorite object that carries some special meaning, elicits a memory of a loved one or evokes an important moment or event. Perhaps they keep it protected on a shelf, hidden in a private drawer, or use it daily. Like a rabbit foot well protected yet worn from frequent rubbings for good luck, it’s somewhere — and it has a story. One of my favorite objects is a string of beads. They have dangled from the rearview mirror of every car I have driven for more than 20 years. I usually resist looking at them. But I always know the loop of blue wooden beads — each with delicately hand-painted light blue and gold flowers — is there. I see the beads often in the corner of my eye, and am accustomed to and comforted by their soft clacking sound as they swing to and fro each time I take a hard turn or jam on the brakes. Their presence provides a sense of security. Kind of like my dad, who has passed on, but is there with me and ready to talk whenever I need. Mostly they remind me of something we shared in our personalities — a fault you might say, but something I’ve come to accept. Dad gave me those beads about a quarter century ago while on a trip to Greece with his second wife. “Worry beads they’re called,” he said when he presented them to me. “They are popular in Greece, and I knew you were the perfect person to have them. Maybe they will help you to stop worrying,” he added, chuckling with that twinkle in his baby blue eyes that just dared me to respond. Then he quickly changed the topic — to what I don’t recall because I was left wondering about this gift I stared stretch across my open palm. It was so different from gifts he typically brought back from his travels. Is it that obvious I worry so much? But who is he to talk? He worried. Not as much as Grandma Mary, his mom, who once kept me up all night as a child when my family was visiting her and she and I for some reason had to share a room. Her chatter, which filled the house during seemingly every moment of the day, continued until dawn. She apologized at one point — around 2 a.m. — for her inability to stop her mind and stop her out-loud worrying. I don’t think I talk nearly that much. (I can hear my kids laughing now at that statement.) But, yeah, the worry is there. 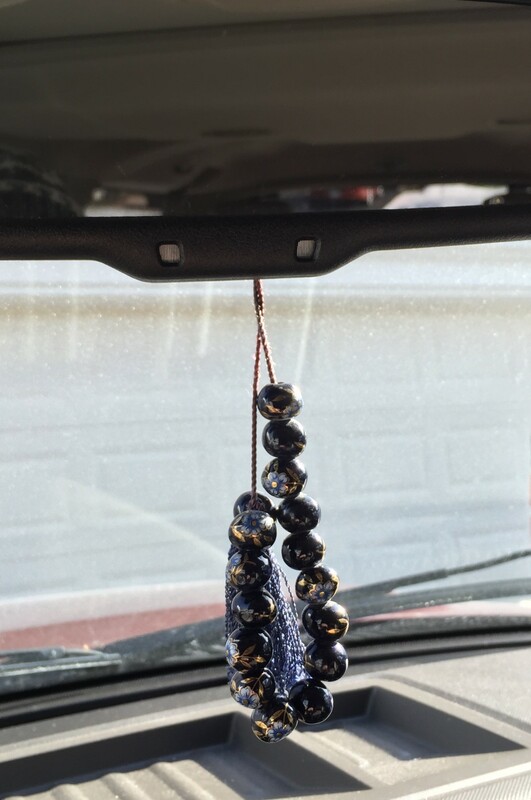 The worry beads have claimed their spot on my rearview mirror ever since I brought them back home. Every few years I pause to look at them and touch them, rubbing their not-quite-smooth surfaces together to make a soft clacking sound. I think perhaps if I do this for a few minutes, I will stop worrying. But no, it’s fruitless. It’s who my father was. It’s who his mother was. But at least with a quick side glance every now and then, I know that somebody understood. And I guess that’s all I need. And I remember dad’s words every time I hear the “clack clack” of the beads as I take another swift turn. So as you put together the old letters and photographs that document your family’s history or your own, don’t forget about those favorite things.